Sarah thought her father, Michael, was having a deathbed conversion. But that’s not what was happening. He was Catholic and had never lost his faith, but for reasons forgotten, had stopped practicing. Now he regretted not setting a better example for his daughter so her faith would sustain her when he was gone. 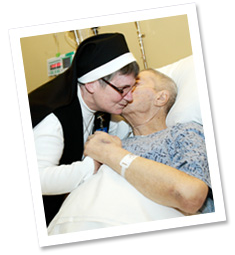 One thing I’ve learned serving terminally ill patients is that religious and spiritual issues are often entangled with family issues. Sometimes, a family will ask me to help prepare a dying loved one for what comes next. But usually, it goes in the other direction. Michael accepted that the end was near, but Sarah couldn’t. Michael thought that he was going home to meet God, but Sarah saw her as losing him forever. After I had met with Michael a couple of times, he asked me to help him renew his practice of Catholic faith. We prayed together, and I made sure he was able to attend Sunday Mass in our interfaith chapel. One day, after a visit, he stopped me from leaving his room. “Sister,” he said as he held out a sealed envelope, “Will you give this to Sarah? I want her to have it, but I’m afraid of how she’ll accept it.” Over the next couple of weeks, I passed on several more envelopes to Sarah, never knowing what they contained. Finally, she stopped me and said, “No offense, Sister, but I don’t understand why my father is being so religious. He’s never been religious before!” Sarah explained that her father had been writing her long letters about his belief that they’d be together again in Heaven, and he encouraged her to renew her faith.Having seen barely a glimpse of religious behavior from her father in 20 years, Sarah was baffled. But she was also comforted knowing that he wasn’t afraid and that he believed he was going home to God. She wasn’t sure she believed that, but she was glad he did. Then one day, she told me: “I went to church yesterday. I prayed for my dad.” I told her to tell her father that. When I looked in on them later, they were hugging. Michael smiled at me and gave a thumbs up. A few weeks later, he left us and went home to his Father in Heaven. I have continued to talk with Sarah from time to time. She is growing in faith, and finding comfort and peace from it. There are days on this job when it can be frustrating when people in great pain refuse help, and I have to remind myself that I am not God and I can only do what I can and leave the rest to Him. But often, I get to play a role in restoring people’s faith at a time when it matters most to them, and that is deeply fulfilling to me. Thank you so much for making Calvary Hospital pastoral care possible. I am so grateful. Outside his room, the daughters explained that their father had had bad experiences with rabbis in the past and insisted he didn’t want anything to do with religion. “But can you still stop by to see him?” they asked. Maybe it was my winning smile because Joel said, “Okay. You can come back.” So I did. At the time, Joel was in a nursing home where Calvary offers hospice services and I was serving as a Calvary chaplain. As the weeks went by, swapping stories of the Bronx, he and I became friends. One day, I got to the door of his room and noticed he seemed distraught. “What are you worried about?” I asked him. “Nothing! None of your business,” he said with irritation, turning away from me. “Nothing!” So I just sat. Finally, he said, “I was thinking of Judith, my wife.” And for the first time, Joel talked about his wife and how much he missed her and wished she were with him now, as his days dwindled. That was the only time I saw Joel pray. But our friendship continued to grow, and I discovered that although Joel denied his religious faith, he was very proud of being Jewish. What he loved was Jewish culture, especially Jewish food. One day he said to me, “What I wouldn’t give for some chrein!” (Chrein is a very spicy relish made with beets and horseradish.) So the next time I came to visit him, I brought his favorite brand of chrein from a good local deli. When I handed it to him, he became misty-eyed and uncharacteristically speechless. After that, he opened up enough for me to see that under all that bluster, his faith was still alive. We call that the Jewish spark. One day his daughters called to say that he was not expected to live much longer and he was being transferred to Calvary Hospital. I drove behind the ambulance to Calvary. As he was wheeled up to his room, he put out his hand to me and I held it as I walked beside him. Later when we were alone, he said to me in a quiet voice, “Did you forgive me?” “For what?” I asked. “For appearing to be intimidating at first.” I replied, “Consider it done.” Joel passed away a couple of days later. I was honored when his daughters asked me to officiate at his funeral. Joel came into my life as a patient, and left as a family member. That’s what Calvary Hospital does. And I know it’s only because of your generosity that it can continue to be that kind of place. My Dear Friend, I keep wishing I could hear Christmas carols on Father Alphonsus’ harmonica this year. Father Alphonsus came to Calvary from Nigeria for a training program. As the Director of Pastoral Care, I have made training chaplains a priority for Calvary Hospital, so I was pleased to welcome a fellow Nigerian to Calvary. But I could never have predicted how much Father Alphonsus would affect every person who came into contact with him here. And everywhere he went, he played his harmonica. I remember one patient who was angry and hurting, and refused to talk with any of our chaplains, or even his nurses. At first, Father Alphonsus had no more luck than anyone else in reaching this man. Then, he decided that words were the wrong approach. Without asking, he simply took out his harmonica and began to play. The patient’s eyes went wide, and after several minutes, he began to cry. And when Father Alphonsus was done playing, the man confessed to him how frightened and angry he was. He was finally able to talk. Father Alphonsus and his harmonica reached the man when nothing else could. When Father Alphonsus finished his training and returned to Nigeria, there was a void left behind here at Calvary. He was a favorite of all the staff, including our doctors, nurses, technicians, cooks, and administrators. He brought joy into the lives of everyone, and we missed him terribly. Then came the very sad news that Father Alphonsus was diagnosed with terminal cancer himself. We begged him to come back to Calvary and give us all a chance to care for him the way he had ministered to others. He did come back to us, and we welcomed him with a gift: a beautiful new harmonica. He smiled from ear to ear, and promptly gave us all a concert. We should have known that even in his illness, Father Alphonsus would continue to be more of a chaplain than a patient. Every day, when he was feeling well enough, he would treat us to his smile and his optimism. He would tell us not to worry. And he would express his joyous faith through his music. To hear him was both uplifting and heartbreaking all at the same time. When you heard that harmonica echoing in the halls, you knew he was feeling okay. There was nothing I wanted to hear more. After several weeks here at Calvary, Father Alphonsus felt well enough to return to Nigeria. Devoted to his flock right to the very end, he wanted to be with the people who loved him and needed him most. It was a hard day at Calvary when we received the news that Father Alphonsus would never play the harmonica on this earth again. I wish I could hear him again now. Though he came here to bring Calvary’s methods back to his parish in Africa, he came to us with a heart already filled with the tradition of acceptance and caring that is at the core of Pastoral Care here. And he taught us about living life with joy. I am very grateful that your generosity helps Calvary offer Pastoral Care to our patients and their families. 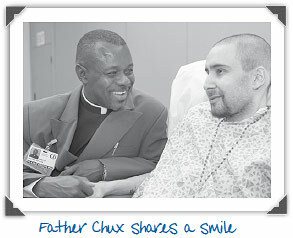 Your support helps us train chaplains like Father Alphonsus, and care for patients like Father Alphonsus. Never before have I met someone who so completely loved God’s gift of life, his own life, and the lives of every single person he met. God bless you. I wish you the most joyous of Christmas Seasons. P.S. We held a memorial service for Father Alphonsus at Calvary that was attended by staff, family members of patients he had helped, most of the priests from the residences where he lived in Queens and the Bronx, and so many others whose lives he had touched in the brief time he was here in New York. We all felt we could hear Father Alphonsus and his harmonica even when the chapel was silent. God bless you.